1. What and where is Paia Beach Movies ? I live on the North Shore of Maui and I thought it would be cool to show movies on the beach. We intend to showcase classics of all genres, but as ever, not everyone's definition of a classic is equal. The 25 foot screen and Dolby Stereo sound system will be located on the sand volleyball court just outside the Paia Youth Center. That's right next to the basketball court on the outskirts of Paia. 2. Why Big Wednesday ? 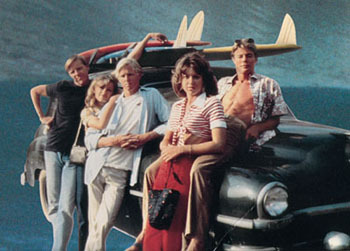 Big Wednesday was (and is) the only good surf movie with a plot. 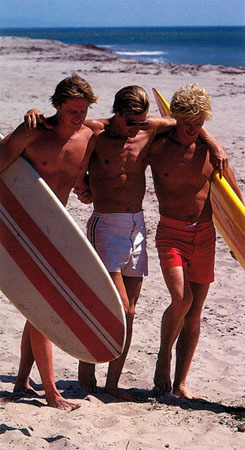 It was made in 1978 and it's a relaxed story about a group of friends growing up near their favorite surf spot. If you have not seen it you should - and if you have - well it's the 25th anniversary so you should see it again on the big screen. 3. What else will you be showing ? That all depends on what you all want to see. Movies shown so far are listed here. Type your email here and hit Enter to be on the cinema mailing list - you will get notified about upcoming movies and special previews.